The dust of doctors-going on strike to grab urgent attention from the Delhi government to their natural problems-was just beginning to settling down. However, similar news of threatening the state government to come and pay heed to the perennial problem of resident doctors is making the headlines again. The Maharashtra Association of Resident Doctors (MARD) has now threatened the state government, with their highlighted list of demands, to go on an indefinite strike. As a mark of clear protests, and indication of the unfortunate time ahead, the doctors attached to 18 medical colleges will wear a black ribbon, on the world doctor’s day-which happens to be today, July 01. The strike by MARD will start from July 02, as reported by the PTI. Slew of demands have been raised by the resident doctors group (of MARD) including a hike in the stipend taking the foremost position. Other demands, such as two-month maternity leave for female doctors, and fixed working hours, has also been reported by PTI. Also included are more demands such as the bond period, leave, and two months paid leaves for doctors contracting tuberculosis. 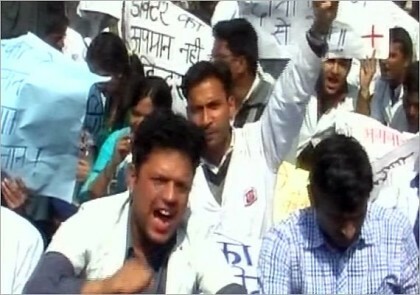 The association has also demanded resident doctors to be posted in their department of specialization. Sagar Mundada, President of the Central Board of Maharashtra Resident Doctors said while treating TB patients, if a doctor contracts the illness, he/she would get six months leave. He said resident doctors have been demanding that they be relieved from the mandatory bond service (to work in rural areas) if there is no vacancy for them within a month after completing the MD degree. Mundada said during the bond service, resident doctors should be given duties in area of their specialisation.